Xeno a (ゼノア) is a human who works as a casino dealer at a state-owned Casino somewhere in Devanagara. They are the Extra stage boss of Brilliant Pagoda or Haze Castle on the Neutral route. As stated in their profile, Xeno a's ability is better described as being able to "freely manipulate probability" but that power of theirs is one used unconsciously, thus that they cannot control. It makes it so even the most improbable events will inevitably happen (Such as a coin flip landing on neither heads or tails, a 6-sided die displaying the number 7, etc.). Their power extends to even their vital functions, and thus, they are able to trump death and be virtually immortal thanks to this. (It is also stated that even if they wanted to die, they wouldn't be able to due to their ability.) However, they are unable to manipulate events in which the probability is 0% in the first place, but since most things aren't completely impossible in the minds of humans, this does not restrict their power too much. Their name is "Xeno a" (ゼノア). JynX was asked about the meaning behind the name, especially the "a", but they responded with "you're free to theorize." A possible meaning to "Xeno" is that, in English, it is a prefix that originates from the Greek xénos, meaning "stranger" or "foreigner", which is fitting due to their general character. The "a" may relate to the Ace cards in poker, since there are aces behind Xeno a. It is unknown if it is their real name. According to JynX, "Xeno a" is written as "世乃亞"[a] in Chinese, which is a phonetic translation of "Xeno a" into Japanese kanji, used as Chinese. 世乃亞 would translate in Chinese into "The world is secondary", or "The world is inferior". Xeno a has been shown to have short, wavy blonde hair and yellow eyes. They wear a black fascinator with a dice accessory sitting on top, with a notable red/black yin-yang symbol as the number one dot, a black vest with a red bow tie and a white shirt underneath that has puffy sleeves, white cuffables with black buttons on the ends on both wrists, a black and white piece of cloth that is partially covers a black skirt with red stripes, white high thighs with black ribbon adornments on the ends, and brown shoes. They also have a Roulette board behind them alongside 3 cards with appear to be the ace of hearts on a pink card, ace of spades on a dark green card, and a black card with Tsubakura/Tsurabami's eye motif, and a Black Jack board. The small yellow text on the board reads "Dealer must draw to 16 and stand", after which the text is obscured by Xeno a. The relationship between Xeno a and Tsurubami is a very interesting one, as they first met at the casino where Xeno a worked, and then battled. But after this battle, Xeno a liked the thought of a battle and kept challenging Tsurubami to numerous battles, coming close to losing, winning, and even had 2 draws. It seems that the 2 are on somewhat good mutual terms, as they are both sparring partners. They might've even looked up to Tsurubami as a role model, as stated in their backstory. It is stated that in Xeno a's backstory, they worked for a state-owned Casino somewhere in Devanagara. They also might be the only character in the Len'en Project to take on a very western-like design. They also might be a faint reference to Sanae Kochiya , because of their ability to cause miracles. 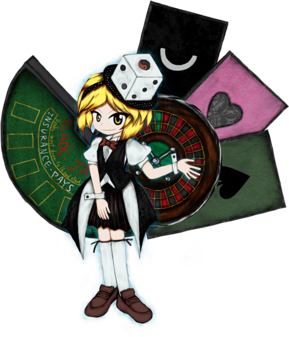 During Xeno a's fight, they use various components of casino games; cards, six-sided die, slot machines, coins, digital game of chance, and danmaku that resembles a roulette board. This page was last edited on 21 February 2019, at 14:07.